It was believed that the heart was a place for doctors and medicine, not surgeons and tools. This sentiment was kept until the 1890s when wounds of the heart were first treated by a handful of brave surgeons. The heart, its anatomy and complications, were all discovered post mortem via dissection. In 1891, Henry Dalton, had to suture a tear in the pericardium (the sac around the heart) to stop a patient from bleeding to death. Although this was a new accomplishment, surgeons still thought they should not perform surgery on the heart. In 1895, Alex Cappelen, sutured a wound in the heart but the patient ultimately died 2 years later. However, it was this surgery that gave others a beacon of hope. Rhen performed the 1st successful heart operation in Frankfurt in 1897. The field of cardiac surgery has sustained extraordinary growth since Rhen's breakthrough, resulting in some of the most spectacular medical accomplishments of the 20th century. However, social implications of the surgery in the 1890s still apeared to be bleak. Surgeons believed that suturing open wounds was possible but operations of the heart to fix natural defects and diseases were still impossible. Massaging the heart was also observed to be useful before the 20th century by a number a different surgeons. By opening the body and squeezing the heart rhythmically surgeons found that a heart that had stopped beating could be induced into working again. However, although this strategy was widely accepted, applying pressure on the chest directly above the heart was relatively unheard of despite its documentation of success by Franz Koerig in 1883. The success of heart surgery relied on not just ideas from a few surgeons but the discoveries and collaborations made from around the world. Without friendly competition and a desire to master new techniques, we very well may not have heart surgery to this day. Brain surgery was not totally unheard of by the 18th and 19th centuries. In fact, trepanation, the act of cutting or drilling a hole in the skull had been around for years. This procedure has many medical importances, but there are also certain mystical practices that use a technique similar to trepanation to release evil spirits from the body. 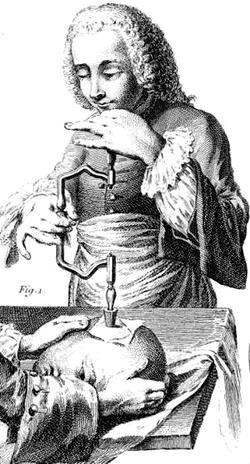 Although trepanation has practical applications in modern medicine it was and is a risky procedure. In the 18th and 19th century the brain would be easily infected and death would follow. Of course, surgeons in the 1700s and 1800s couldn't have imagined that surgery on the brain was possible. Like the heart, the brain was untouched for many years.